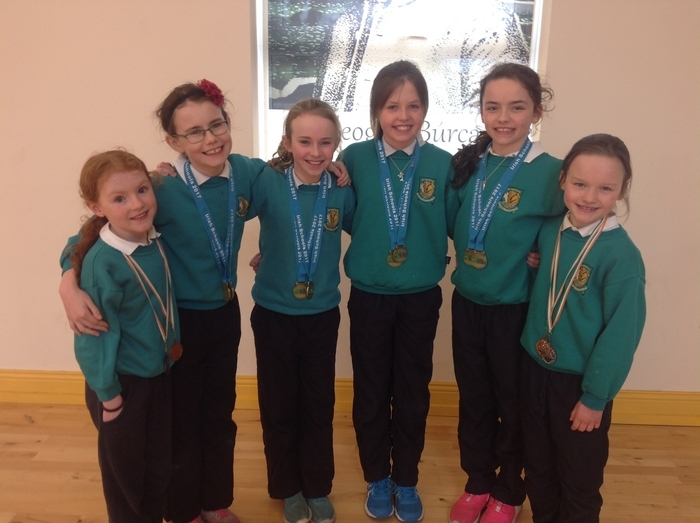 The girls' swimming relay team from Gaelscoil Uileog de Búrca who competed in the All-Ireland Minor Schools Swimming Competition. They won a number of medals at the championship. From fundraisers to fun days, we've got you covered in Community Diary each week, if you'd like to have an event included, please email: [email protected] by 5pm on the Monday, before publication. A fun filled night of entertainment with Frank Forde, Michael S Tougher, Kay and the Country Stars and other local artists, will be hosted in the Talbot Hotel, on Friday, March 31, at 9.30pm. Tickets cost €10, and for more information call Helen on (083 ) 1236123. Connacht Pioneers are having an afternoon of prayer in the Blessed Sacrament Chapel Knock on Sunday, from 3pm to 6pm. All are welcome. All are welcome to Calvary Church Castlebar, 9 Humbert Mall, for free St Patrick's Day activities from 12 noon to 2pm including face-painting, colouring, refreshments, and a chance to learn about Patrick's message. Cara Iorrais is having an open day in “Cara Iorrais (Belmullet/Erris Cancer Support Services )” Church Road, Belmullet, to celebrate the 10th anniversary of Cara Iorrais on Friday, March 24, from 11am to 4pm. For more information contact (097 ) 20590. Growing Locally's community market will be on the Square, Claremorris, on St Patrick's Day from 1pm. Meet regular stallholders including Glasrai, vegetable growers from Hollymount, and Phil from Philly's Parlour with her famous iced buns and cakes. Gourmet Burgers from Galway will be offering tasty snacks with homemade relishes. There will also be some lovely knitted craft goods. It will be back in its usual home in Growing Locally, Mayfield, every Friday afterwards. South West Mayo Development Company outreach clinic takes place everyMonday from 10am to 1pm in Claremorris Family Resource Centre. If you are thinking of setting up your own business and need advice with a business plan – Breda Murray (South West Mayo Development Company ) will be there to help and assist you with any queries you may have. Contact (094 ) 9377838 to make an appointment. Barnacarroll over 55s group meet every Wednesday morning in Barnacarroll Community Centre from 10.30am to 12 noon, all are welcome. Barnacarroll Childcare Services is now taking enrollments for pre-school for September 2017 and there will be an open evening on Thursday, March 23, from 7pm to 8pm. Contact the office on (094 ) 9376695 or (087 ) 6488995 for further information. Bingo continues every Monday night in Balla Resource Centre at 8.30pm and 25 partners cards continues every Saturday night at 9.15pm in the centre. There are a number of other classes and events taking place throughout the week. Thursday night Pilates classes take place from 8pm to 9pm. On Friday afternoons at 3pm, the active retired group meets. The guardian and toddler group meets each Wednesday from 10.30am to 12 noon and a Bible study group meets each Thursday evening, from 8pm to 9pm. A young Catholic adult conference will take place in the Castlecourt Hotel in Westport on March 25. The event will bring young people from all over Ireland together to celebrate their faith through dynamic talks, group discussion, and prayer. Speakers include renowned evangelist Rosemary Swords. The event promises to be a rewarding opportunity to engage with your faith in the company of other young Catholics. The conference fee is €15, and includes lunch and refreshments throughout the day. For further information call Breda on (087 ) 2747873. Claremorris FRC in association with Tesco and Aldi are participating in the community Food Cloud scheme. Food is available twice a week from its centre to individuals and families. This scheme is run in the strictest confidence. Please contact the centre on (094 ) 9377838 for further details. Enable Ireland Mayo services is holding a church gate collection in Kiltimagh on Saturday and Sunday and it is seeking volunteers to help on the day. Contact Mary Mulryan at (087 ) 2796295 or [email protected]. The Order of Malta 2017 pilgrimage to Lourdes will take place from Friday, May 5, to Wednesday, May 10. There is choice of hotel rooms, with the sick and disabled being cared for by a staff doctors, nurses, care assistants, EMTs, and paramedics who will be on the pilgrimage. This year's pilgrimage will mark the 30th anniversary of the first Knock to Lourdes flight. For more information contact John Egan on (087 ) 2515422 or Michael Rattigan on (087 ) 2929372. A 25 Card Game in support of Western Care Association's Ballyhaunis Day Services will take place in Brickens Community Centre on Tuesday, commencing at 8.30pm sharp, Admission is €5. Also, a 25 Card Game (Doubles ) in support of Western Care Association's Newport residential and respite services will take place in Turlough Community Centre on Wednesday, commencing at 8.45pm sharp, admission is €10. Mayo North East will hold a free governance training workshop in the Newman Institute in Ballina on Tuesday March 21 from 7pm to 10pm. The training is for Type A community groups. These groups are run by volunteers and do not employ staff. This training is funded under the Social Inclusion and Community Activation Programme (SICAP ) and will be delivered by the Carmichael Centre. The workshop will provide practical guidelines on compliance with the Governance Code for Community Voluntary and Charitable organisations. Places are limited, to reserve a place contact Patricia Crawley on (087 ) 2135960 or email [email protected]. There are a number of courses starting or running in the Claremorris Family Resource Centre this month, digital media skills classes are running on Tuesdays from 2pm to 4pm, beginners and advanced Spanish classes will start on Wednesday from 8pm to 9.30pm, dressmaking classes will start on Thursday, Polish classes will commence in the coming weeks, and mental and emotional wellness workshops will start on Thursday, March 23. For more information on any of these classes contact the centre on (094 ) 9377838. Mayo North East under the Social Inclusion and Community Activation programme [SICAP] is recommencing the Homework Club in Ballycroy Community Centre on Tuesday, March 28, at 5pm. The club will run for six weeks excluding the Easter break. The club is free of charge and offers students a space to study and complete their homework, while receiving tuition in maths and Irish from two experienced tutors. This is particularly beneficial to exam year students. To book a place or for more information call the Mayo North East office on (097 ) 20828. Due to the continued increase in demand for its services in Castlebar - The Order of Malta Ambulance Ambulance Corps is now expanding its team of dedicated volunteers. If you are interested in becoming a member of the Order of Malta in Castlebar, call (087 ) 7074514.